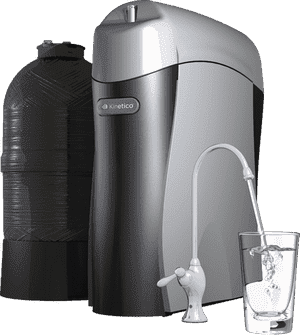 What makes the K5 Drinking Water System superior to other options? The K5 is certified to remove more contaminants than any other reverse osmosis system. It has customizable multistage filters to meet the specific water challenges that you face now or that you may encounter in the future. And thanks to EverClean® Rinse, it uses the same high-quality water produced by the system to clean itself. This keeps it in top working order and automatically extends its life. Ten years on all parts, including reverse osmosis tank, faucet, and the reverse osmosis membrane. Ten years on all parts, including reverse osmosis tank and faucet. Four years on the reverse osmosis membrane. The Kinetico K5 Drinking Water Station is tested and certified by WQA against NSF P231-microbiological water purifiers. The Kinetico K5 Drinking Water Station is tested and certified by NSF International against the requirements of NSF/ANSI Standard 42 for the reduction of aesthetic chlorine, taste and odor. Standard 53 for reduction of MTBE, and Standard 58 for the reduction of pentavalent arsenic, barium, radium 226/228, cadmium, VOC, copper, cysts (including oocysts of cryptosporidium and cysts fo giardiasis and entamoeba), fluoride, hexavalent chromium, lead, nitrate/nitrite (with test kit Part No. 7329), selenium, TDS, trivalent chromium and turbidity.